NZ born Samoan (Vaimoso / Faleapuna) and Cook Is (Vaipae – Aitutaki) Junz comes to TYLA with many years of experience as a youth worker working with young people at risk. 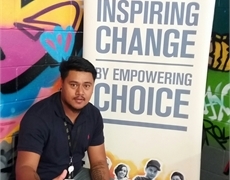 The majority of that time being spent in different parts of Auckland, junior has come to Otara to start his career as a social worker and give back to his community. Raised in Otara and a graduate of MIT he looks forward to the work ahead and hopes to 'Inspire Change by Empowering Choices' with the young people and families he supports in Otara and South Auckland.